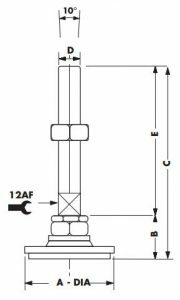 We stock a range of sizes of heavy duty adjustable levelling feet with the handling of heavy weight ratings and an ideal choice for extremely heavy equipment that requires a good degree of angling scope. These stainless steel adjustable levelling feet are ideal for heavy industrial, light industrial, commercial or workshops that are located in a wet or wash down areas. Adjustable levelling feet can solve problems with uneven floors and we often supply to businesses in the hospitality, retail, food, mining, medical, fishing, marine, manufacturing and any light or heavy commercial industry who require level structures for heavy equipment. The HDA is an extra heavy duty, alternative design A-Justa-foot, ideal for very heavy machinery with a 10° pivot angle. The complete unit including base, stud and locknut are all 304 stainless steel, making it perfect for wash down areas. 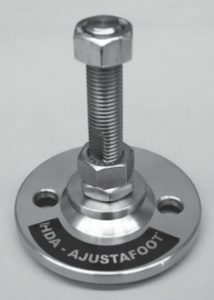 The HDA is available in 90mm or 125mm base, with stud sizes M16, M20, M24 available in 2 lengths. 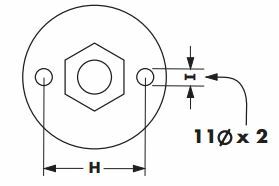 The complete HDA range is also available in bolt down (HDA 231 Series), with a 60mm centre for a 90 base, and 90mm centre for 125 base. All bolt down holes are 11mm diameter. Comes complete with Anti-slip pad and locknut.